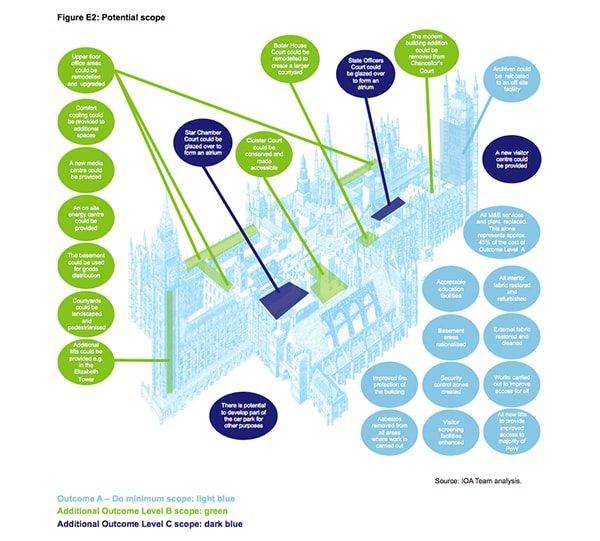 Last week’s “Options Appraisal” report detailing a range of scenarios for carrying out a major restoration and renewal programme for the Palace of Westminster contains details on the use of BIM and “Integrated project Delivery”. 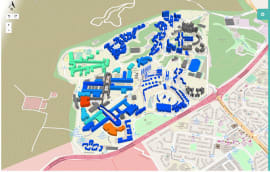 The report outlines three potential delivery options for the large-scale refurbishment, ranging from a “do minimum” multi-phased approach lasting up to 40 years, to making significant improvements in an intensive single phase of perhaps six years. The entire programme is costed at between £3.5bn and £4.7bn. 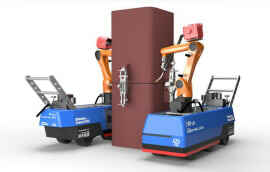 However, it also suggests that the return on investment in BIM reduces as the schedule for delivery extends. Written by financial consultant Deolitte, architect HOK and Aecom, the document suggests that the overall approach to design management will be influenced by the choice of delivery option and the client’s willingness to accept risk. 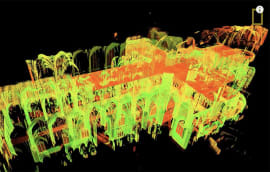 Giving further details in a technical appendix to the report, the authors anticipate a full point cloud laser survey of the Palace of Westminster, but acknowledge that this might not prove fully accurate, especially in plant rooms that have have become highly congested. The report outlines various options in terms of timing, but acknowledges that “a significant risk with the E1 approach [over 24-40 years] would be the danger of software obsolesence”. Meanwhile, it suggests that BIM would bring the greatest advantage under Option 3, the full move-out option estimated to take six years. 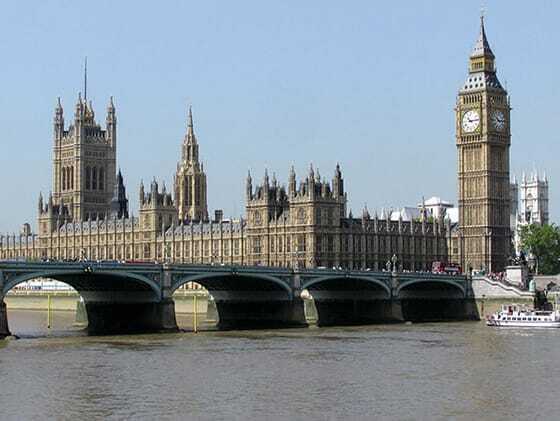 The report says the Palace of Westminster could be built as a single 3D model, which would benefit the design, and modelling the whole building in one go would be more accurate than attempting to piece bits of the model together. 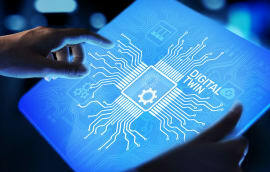 The BIM model could then be beneficially used for asset management at the end of the programme. The report also cites the example of the restoration of parliament buildings in Ottowa, Canada, where hundreds of laser scans of the exterior and interior formed the “backbone” of a BIM model. It also says that BIM can be used to improve project communication with the public, with an example being the restoration of the Pantheon Dome in Paris. The authors also put forward the notion of Integrated Project Delivery, as a means of curtailing costs on the project, defining it as “an approach to delivering projects that integrates people, systems, business structures, and practices into a process that collaboratively uses the skills of all participants to optimise programme results”. IPD suggests a fully collaborative, risk-sharing approach, often with a bespoke contract. The report suggests that “relationships between the major parties in construction programmes using traditional delivery approaches have grown increasingly adversarial and antagonistic to the effect of being counterproductive for all”. Can someone please explain why this project is proposing the use of the American proposals for Integrated Project Delivery (IPD), whilst HMG Construction Strategy requires all Government procured projects to meet the requirements of BIM Level 2, the delivery of BIM data in accordance with the Information management requirement defined in the British Standard 1192 series of documentation? 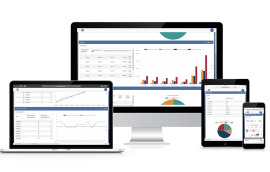 A series of requirements based on tried, tested and measured processes in the UK, documented and delivered with British Standards moving to ISO and the catalyst for driving out waste from the construction industry. Surely the only delivery option on the table should have been a bog standard BIM Level 2 delivery, to show the industry that the government is serious about meeting its own targets and to prove to the sceptics out there (of which there are still many) that BIM Level 2 is totally feasible and that it isn't going away. Secondly, the risk of software obsolescence over 25-40 years is surely mitigated by the open BIM strategy of using the open source IFC file format? Even if they went totally native, the likes of Autodesk and Bentley have had their proprietary file types being fully supported, including conversion from one format to the other for nearly three decades now!